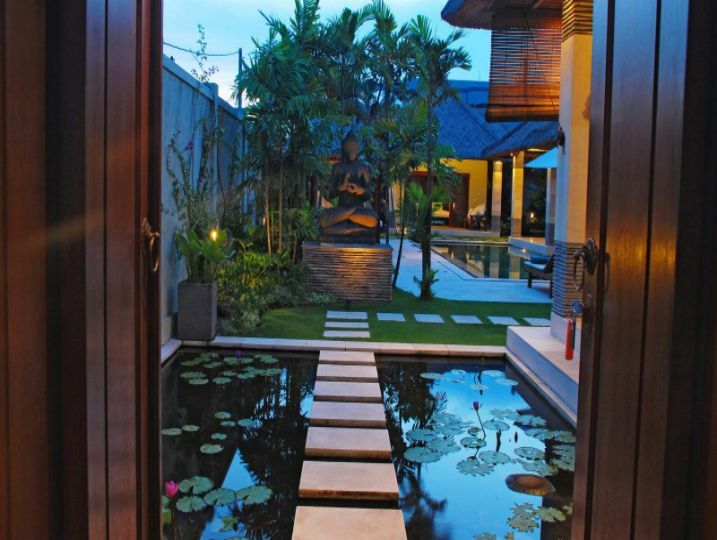 Ideally positioned on a secluded lane just 10 minutes walking distance from three major destination roads, the Villa Cinta, 3 Bedroom Villa, Seminyak Villas puts the highlights of Southern Bali at your door-step: Restaurants and cafes to suit every taste and budget, shopping in boutiques and art galleries from the cream of Bali’s talented designers, the nightlife of bars, live music and salsa clubs, spa and massage services and the universally popular Seminyak beach. 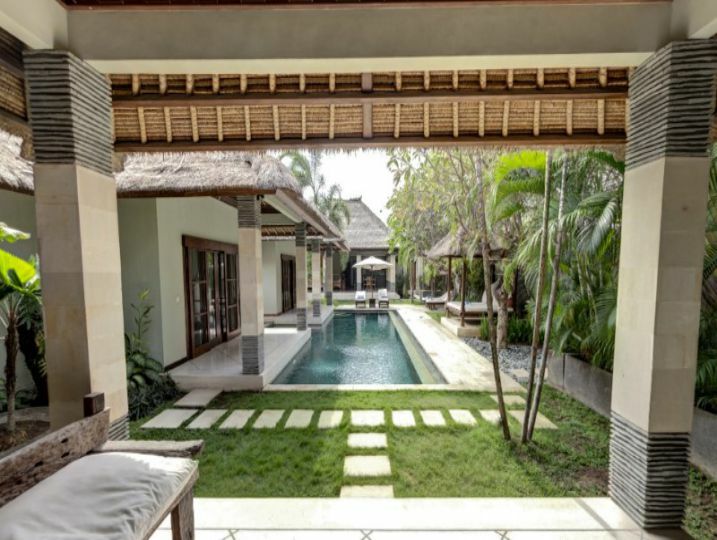 Tastefully furnished and thoughtfully appointed, this Villa Cinta in Seminyak, Bali is arranged as four separate structures within a walled garden. 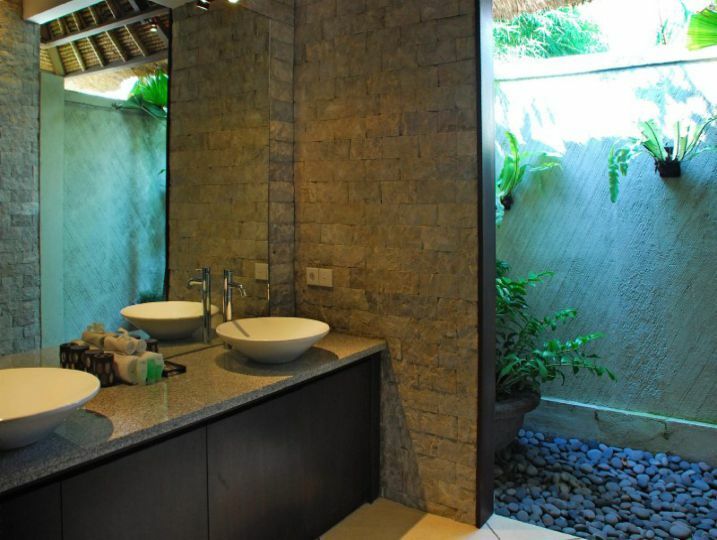 Echoing a traditional Balinese family compound setting each bedroom is an individual bungalow, giving the impression of privacy within a communal living space. 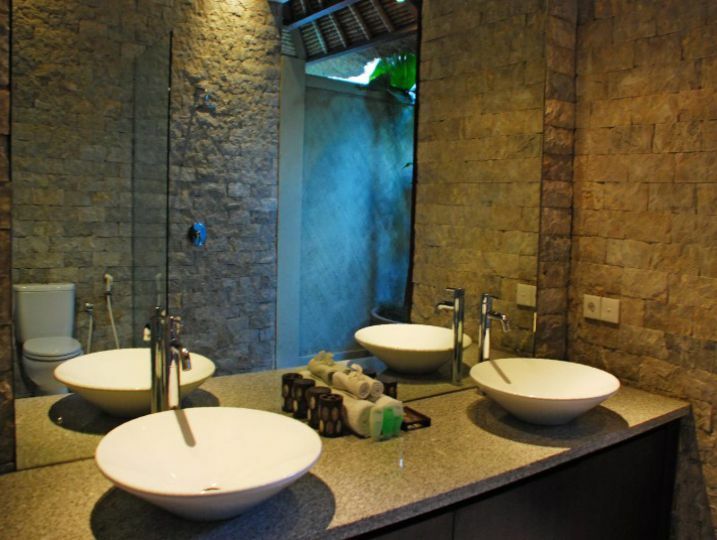 The main pavilion houses the fully equipped open-air kitchen, living and dining area and an air-conditioned television room with international channels, DVD player and HiFi sound system. 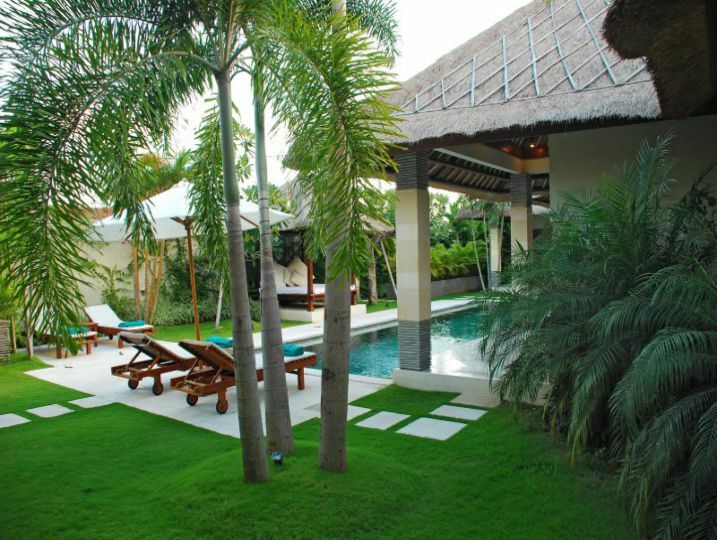 Three air-conditioned en-suite bedrooms, each under a thatched roof, face the sparkling pool and inviting outdoor seating areas. 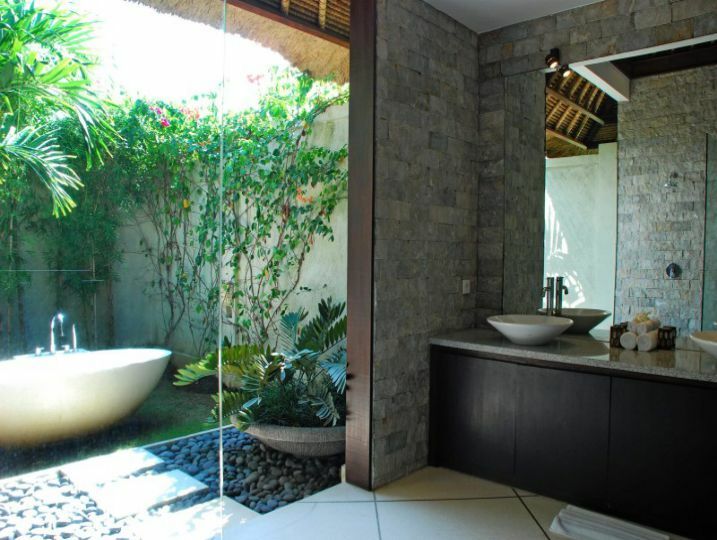 Bali Villas Holiday Vacation Rentals Master guesthouse features a king-size double bed, elegant bathtub and twin sinks. 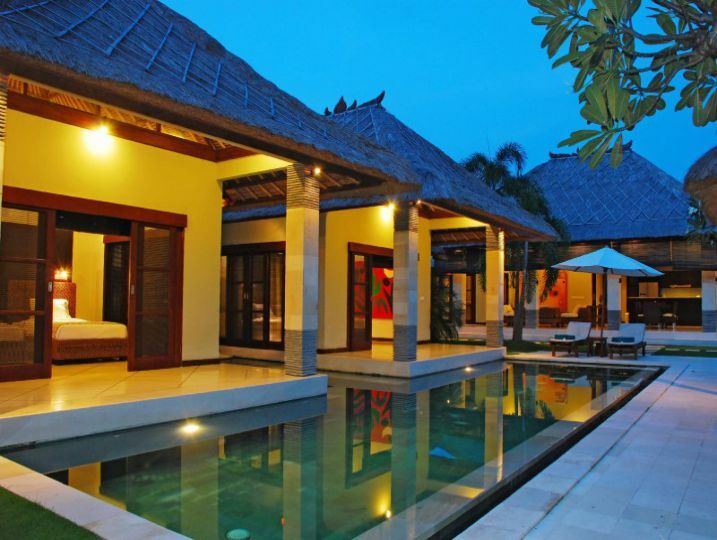 The two remaining guesthouses are twin singles, each with a terrace that leads directly into the pool. 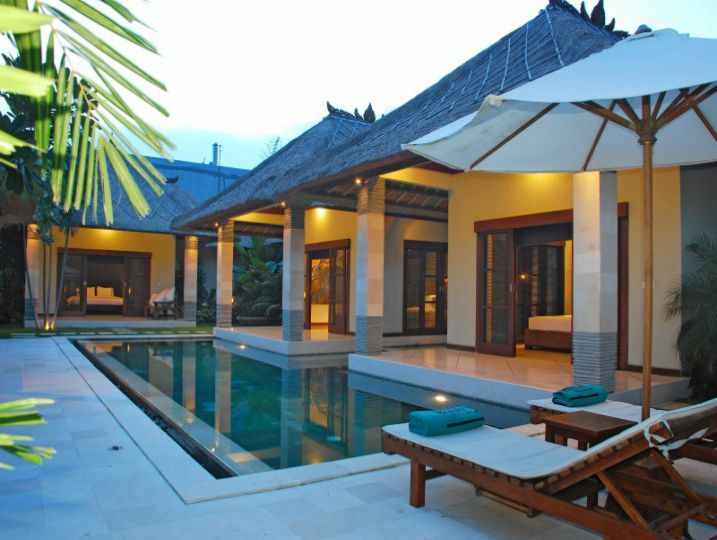 Staffing levels are planned to keep the tropical holiday experience flowing smoothly at the Villa in Bali: Manager, daily housekeeping, personal guest assistant, pool and garden attendants and 24-hour security. 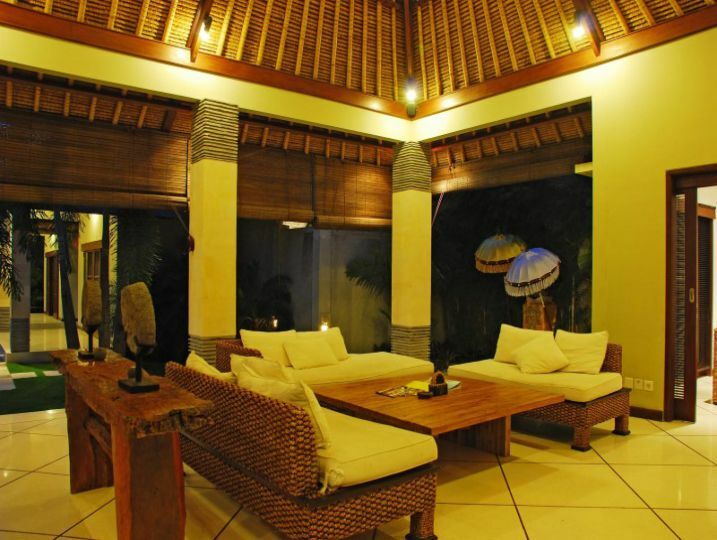 Main Living Area( Open-air living area, Ceiling fan, HiFi sound system). 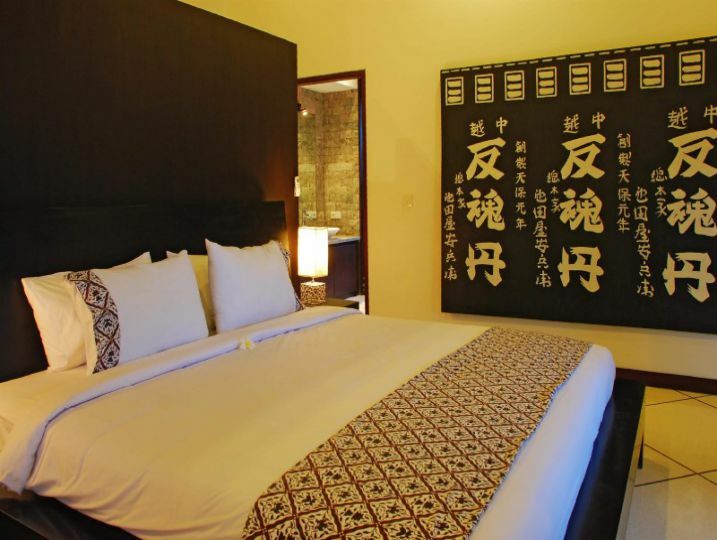 Bedroom 1( Guesthouse (stand-alone) style, Semi-outdoor ensuite bathroom with bathtub, King size bed, Air-conditioning & ceiling fan, Wardrobe with safety deposit box, Terrace outside bedroom). 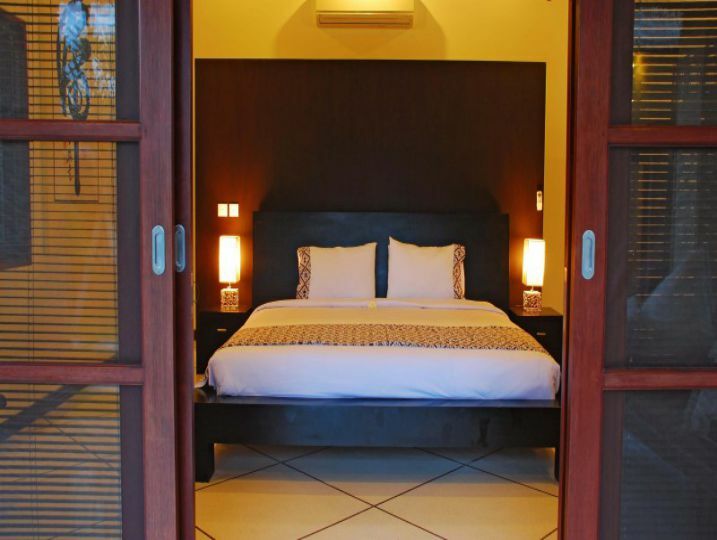 Bedroom 2( Guesthouse (stand-alone) style, Semi-outdoor ensuite bathroom, Single size bed x 2, Air-conditioning & ceiling fan, Wardrobe, Terrace outside bedroom). Bedroom 3( Guesthouse (stand-alone) style, Semi-outdoor ensuite bathroom, Single size bed x 2, Air-conditioning & ceiling fan, Wardrobe, Terrace outside bedroom). Bedroom 4( Guesthouse (stand-alone) style, Semi-outdoor ensuite bathroom, Single size bed x 2, Air-conditioning & ceiling fan, Wardrobe, Terrace outside bedroom). 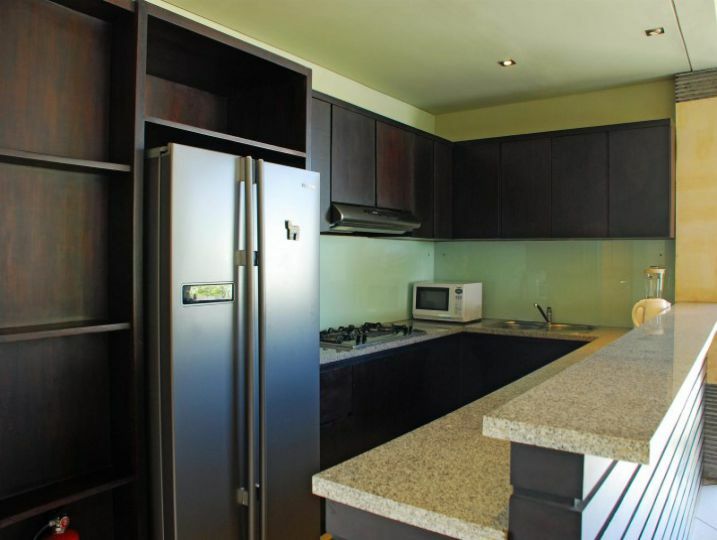 Kitchen and Dining( Open-air kitchen & dining area, Microwave, Full-size refrigerator). 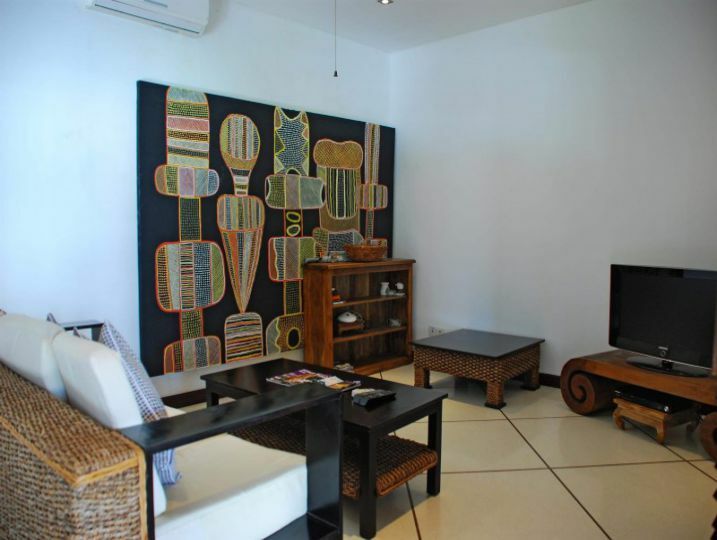 Additional Living Area 1( TV room with air-conditioning, Lounge setting, Television with international channels & DVD player). 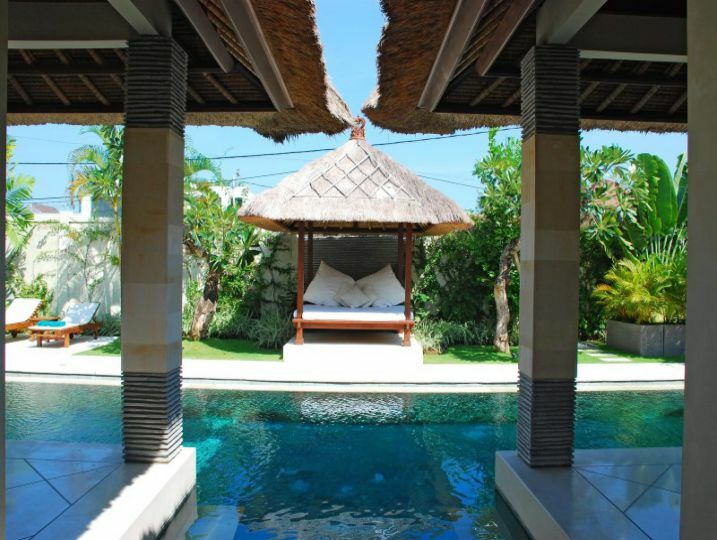 Swimming Pool Area( Private swimming pool, Swimming pool child safety fence available – charges apply, Bale’ (small Balinese gazebo) with ceiling fan, Poolside sunlounges with umbrellas, Poolside shower). 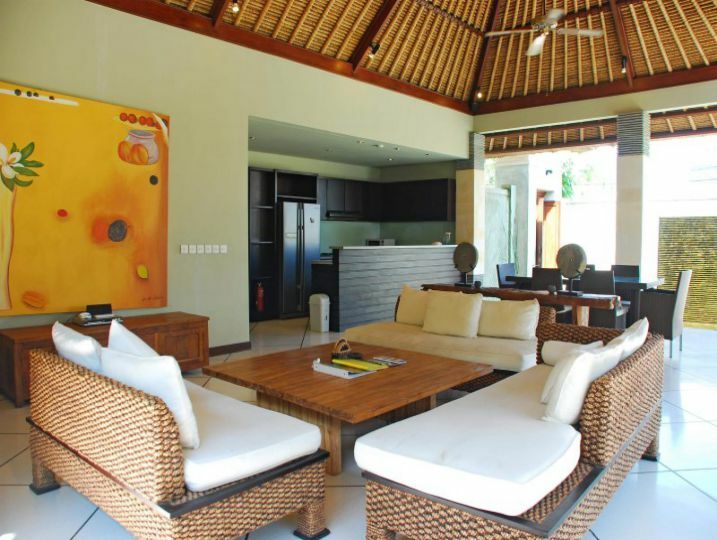 Villa Cinta – 4 Bedroom is available for selected dates.